Russia’s foreign policy needs to be more flexible with regard to its neighbours. Russia has been able to establish somewhat better relations with the West, after failed attempts of the early 1990s, when the process of systemic transition, disintegration of the USSR and the defeat of communist ideology had created domestic turmoil, undermined its international standing and influence over the former Soviet geo-political space. This had led to Russia being treated as a ‘junior’ and not an ‘equal’ partner by the major powers. Recent developments however promise Russia a more equal standing vis-à-vis the West. This was evident at the summit held in Lisbon on November 20, 2010 and which was preceded by a Russian, French and German meeting at Deauville, the ‘reset’ in USA-Russian and Polish-Russian relations, and the new START treaty. Despite lingering suspicions, both sides are forging better relations. But how enduring is this rapprochement likely to be? Russia perceives the expansion of NATO as posing a threat to its security. While NATO’s continued relevance was under question post the end of the Warsaw Pact in 1991, its enlargement towards Russia’s borders belied NATO assurances that Russia was no longer perceived as an adversary. The former Soviet republics of Estonia, Latvia, and Lithuania sought NATO membership for the security it gave them as per the “collective defence” principle enshrined in Article 5 of the NATO treaty. Despite the improving relations, Poland, the Czech Republic, Romania and Hungary are wary of Russia. NATO, at its Bucharest summit in 2008, supported Georgian and Ukrainian applications to the MAP (Membership Action Plan) for joining NATO. If these accessions materialise, Russia would be surrounded by Pilsudski’s Intermarum states. NATO strategic concepts were formulated during the Cold War to deter Soviet invasion. The dimensions of the threat have changed since then. NATO clearly spelt out the real current threats in its 2010 strategic concept. 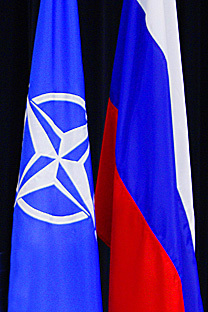 While the possibility of a conventional attack on NATO territory is deemed low, the other threats identified were: proliferation of ballistic missiles, nuclear weapons and weapons of mass destruction; possibility of terrorists acquiring nuclear, chemical, biological or radiological capabilities; instability or conflicts beyond NATO borders, trafficking in narcotics, arms and people; cyber attacks; energy security compromised by disruption of supplies and other such environmental and resource constraints. It may be noted that despite the bonhomie at Lisbon, phrases like ‘disruption of energy supplies’, ‘cyber attacks’, ‘territorial integrity’ and ‘Russian transparency on its nuclear weapons in Europe’ and that it should ‘relocate these weapons away from the territory of NATO members’ were clearly directed at Russia. The Lisbon summit’s approval of a new ‘strategic concept’ - which states that ‘NATO poses no threat to Russia’ and is ‘[determined] to enhance the political consultations and practical cooperation with Russia in areas of shared interests, including missile defence… and the promotion of wider international security’ – is a positive step. The Russia-NATO joint statement said: ‘the security of all states in the Euro-Atlantic community is indivisible;’ ‘the security of NATO and Russia is intertwined;’ ‘the NRC member states will refrain from the threat or use of force against each other as well as against any other state. We agreed to discuss pursuing missile defence cooperation. We agreed on a joint ballistic missile threat assessment and to continue dialogue in this area. The NRC will also resume theatre missile defence cooperation. We have tasked the NRC to develop a comprehensive joint analysis of the future framework for missile defence cooperation....’ All these constitute important breakthroughs. Russian relations with Europe and America have thus entered the ‘re-set’ honeymoon period. But many issues still remain unresolved. Marko Papic has highlighted the divergence of interests and threat perceptions of different European Union state groups, which he has categorised as ‘the committed European Atlanticists’ (the UK, the Netherlands and Denmark), Germany and France and their junior partners, the Central European states, and the so-called Intermarum countries that stretch from the Baltic to the Black sea, whihc ‘are traditionally wary of Russian power’ and ‘rely on an alliance with Western Europe to counter such power’). Russia’s foreign policy also needs to be more flexible with regard to its neighbours. It engages negatively with them by using its energy resources and supplies as a diplomatic tool. It engages with core European powers on a one-to-one basis which results in a lack of consensus with the rest on various issues. It is allegedly involved in the internal affairs of neighbours like the Ukraine, Belarus, etc. NATO’s willingness to deploy ballistic missile defences, the impasse over the conventional arms control agreement—the Treaty on Conventional Armed Forces in Europe, and Russia’s assertion over the former geo-space of the USSR could lead to continued security dilemmas. The West also has issues with the Russian superiority in tactical nuclear weapons, while Russia objects to NATO’s missile defence system that is ostensibly meant for intercepting attacks from the Middle East/Iran. It seems that the West is applying the Huntingtonian clash of civilisations argument or simply using it as a ploy to position its missiles close to the Russian borders. In retaliation Russia has deployed tactical nuclear weapons close to its western borders and in Kaliningrad.